Enable God Mode for Windows 7 Control Panel: In my opinion, the new Control Panel in Windows 7 lacks in functionality with a focus on condensed page presentation.Â This can pose an issue by forcing the user to navigate deeper into a menu item to locate a specific setting or option. With Windows Vista, this was partially resolved by switching to classic view. With Windows 7 comes yet another option. A hidden “God Mode” feature or Master Control Panel. 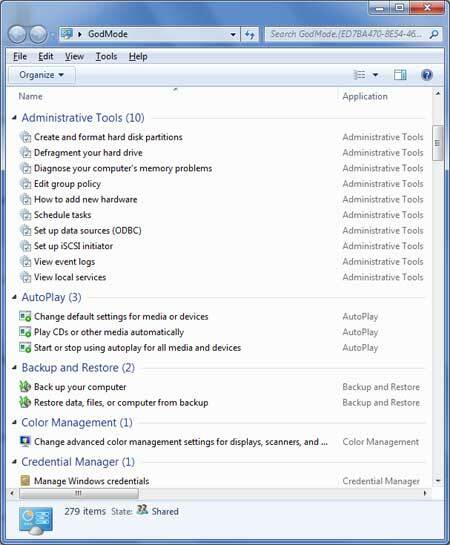 The God Mode Control Panel in Windows 7, offers a list of all settings and options on one page. In the following simple solution, I’ll show you how this Win7 God Mode Master Control Panel can be easily enabled. 2. Rename the new folder using the following name. Once renamed, notice the folder appears with a control panel icon.